On Sunday, May 6, 2018 the sixth annual Borshch Cook-Off took place in our church hall raising over $4,000 toward the critical needs of children in an orphanage in the city of Kryvyj Rih in the Dniepropetrovsk region of Ukraine. Each year the Borshch Cook-Off brings together our parish community and many other generous supporters to raise funds for these orphans with significant health problems. For many years we had supported Orphanage #2 which was comprised of children who were HIV positive, deaf, had mental disorders, developmental delays and other serious health conditions. 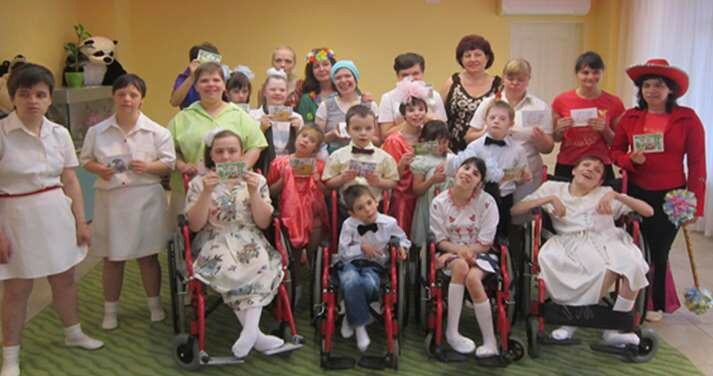 Sadly, the orphanages in Ukraine are extremely underfunded and so the proceeds from the annual Borshch Cook-Off allowed us to purchase basic essentials for the orphans, such as, socks, underwear, towels, blankets, soap, shampoos, toothpastes and toilet paper. We were also committed to providing basic living essentials, such as pots and pans, plates, cups, towels, warm blankets, etc., to the children who leave the orphanage at the age of 17 and start living independently in hostels, since Ukrainian government funded social assistance for them was inadequate. We received many notes of sincere gratitude from those children and assurance that we have made a significant difference in their lives. Due to government restructuring of the orphanages, Orphanage #2 became a rehabilitation facility and the children were sent to other orphanages. Therefore, our volunteers in Ukraine, Nadiya & Bohdan Petryk and Liliya & Vitaliy Stetskevych, parents of our parish members Olena and Victor Stetskevych, provided critical information about the orphanage situations and based on this information the Project Committee selected a new orphanage where the children are in need of our support. This year the Kryvyj Rih orphanage that we are supporting has bedridden children with very serious health conditions and they require total care. We were able to purchase 15 new beds and the appropriate orthopedic mattresses for these children. This was a critical need as the orphanage did not have the funding to buy longer beds for those children who were outgrowing the beds and to buy mattresses to provide better support for these children who must spend much of their day in bed. Committee co-chairpersons, our parishioners Olena Stetskevych and Iryna Carman, note how fortunate we are to have volunteers that we rely on to visit and have direct contact with the orphanage, so we know exactly what their specific needs are and that our resources, are being used as intended. There are no administrative costs for the Borshch Cook-Off as everything is donated, so all the proceeds benefit the orphans entirely. We communicate directly with the administration of the orphanage to learn of their most critical needs, and then the Project Committee, after discussions with the volunteer families in Kryvyj Rih, who make periodic on-site visits, decides which of the needs we can support. Items are occasionally purchased in Ottawa and sent to our volunteers in Ukraine. More often our volunteers in Ukraine make the recommended and approved purchases and provide us with the purchase receipts for reimbursement, as well as photos of the items being delivered to the orphans. We extend our most sincere gratitude to all 27 volunteer chefs that participated in this year's Borshch Cook-Off creating a variety of delicious borshch and beautiful displays, the commitment and dedication of our judges, and all those who came together to donate on behalf of the orphans. Best display was awarded to Tamara Fulmes. In the Vegetarian borshch category, the judges awarded first place to Olena Matsypura, second place to Daryna Stavnycha and third place to Olya Moscicky. Daryna Stavnycha won the People's Choice award. In the Meat borshch category, the judges awarded first place to Inna Skrypnyk, second place to Taras Zalutsky and third place to Tamara Fulmes. Tamara Fulmes won the People's Choice award. Thank you to all of you who have provided the support for this project through your talents and your generosity, and have blessed the orphans with your love. We have shown by our actions that we are, indeed, our brother's keeper, as written in Matthew 25:40 “Whatever you did for one of the poorest of these brothers and sisters of Mine, you did for Me”. We know that we are making a difference in the lives of these children and are walking an honorable path of Christian giving.